1. 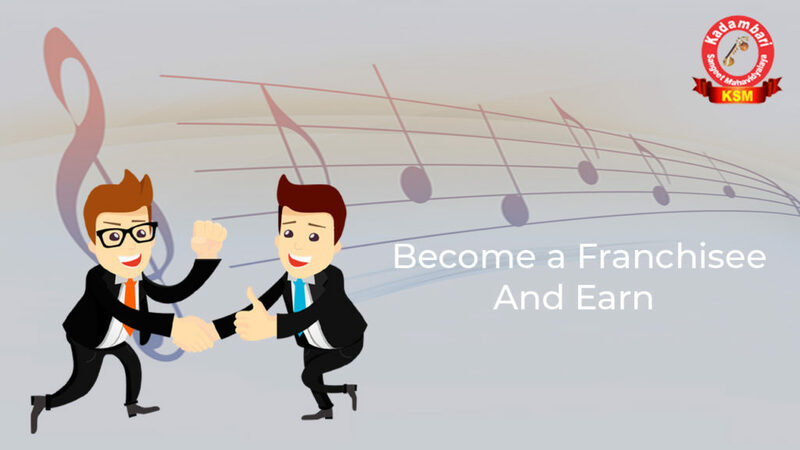 We have created a well-structured franchise system that will assist you with every conceivable issue that may arise in running a Kadambari Sangeet Mahavidyalaya branch. 2. Our assistance mechanism is building under a continuous process of gradation based on the feedback from our existing franchisees. 3. You will get benefit from the presence of an organization that provides extensive franchisee benefits in the following ways. The music production is designed such that every student at Kadambari Music Academy can be proficient in composing and arranging a song. The method of teaching music is very simple and become one of the best music production school in Delhi. We are one of the best music school to provide the right kind of training in Delhi. Our main focus is to introduce the best music learners and make them an artist to be celebrated internationally. You can enhance your musical skills with the help of best singing and music teachers. Along with training in music promotion, singing, playing musical instruments. Enhance your musical skills with the help of best music teachers in Delhi. Along with the training in singing, playing musical instruments, music promotion, etc, we also guide our students in the songwriting process. We help our students in making background scores and composing their own musical pieces. Kadambari Sangeet Mahavidyalaya proclaims to be the best music academy in Delhi and our method of teaching music studies has been really praised. Through live performance which are duet, solo and group performances and primary focus is to giving our students as much experience as they can grab. Kadambari Sangeet Mahavidyalaya teaching the modern techniques that are related to arranging a music track. Our music syllabus is designed to make you more confident and enhance your musical knowledge of becoming a professional artist. Our music teachers have formed ensembles of our students to giving them a great experience of performing whether singing, dancing, playing guitar etc. Kadambari sangeet Mahavidyalaya present a no risk, profitably replicated business model and low investment that is sync with the today’s social-economic scenario. According to the market survey, music and dance arts academy financially a viable and more sustainable business. We gave you a great opportunity to a well replicated and highly successful KSM franchise which is successfully proven a great business model. We are committed to ensuring a smooth launch and running of business with complete back assistance by our professional, committed and enthusiastic professional team. 1. We also provide franchisee. Having access to a successful KSM brand name, which already had recognition thereby reducing precious time huge expenditure and efforts that are involving in establishing a huge reputation and creating a huge brand name. 2. By becoming a franchise, an entity or an individual is allowed to use concepts or services that are offered by the parent company. 3. It is a great decision to become our franchise and gain from our successful and expertise business model. By this, you could also establish music school with nationwide recognition. 5. We provide a complete back assistance of a leading brand and nationally recognized in the field of performing arts and music. 6. Our team will support your needs in operations, teacher training, marketing and more on a regional, local and national basis. We also get in touch with you and guide you for the several formalities for the site inspection.